Clotrimazole is an antifungal cream which is used to treat infections caused by fungi, such as ringworm, athlete's foot, Thrush, and jock itch. Our doctors are on hand to ensure Clotrimazole is safe for you. Order before 3pm, Mon-Fri, and our UK pharmacy will dispatch your treatment the same day. How Do I Use Clotrimazole? Clotrimazole, which goes by the brand name Canesten, belongs to a group of medications known as imidazoles. It's an antifungal agent that attacks the cause of a fungal skin infection. Clotrimazole is an active substance. 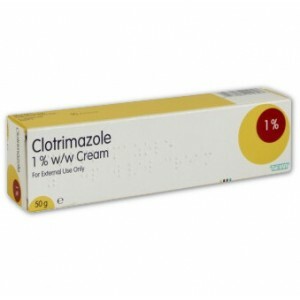 Clotrimazole is used for treating fungal skin infections like ringworm and jock itch. Ringworm: Since ringworm is a fungal infection on your skin, the recommended treatment to treat it on your body is an anti-fungal cream like Clotrimazole. Clotrimazole attacks the fungi that are causing your ringworm infection to allow your skin to heal. Clotrimazole anti-fungal cream is simple to apply and has enough power to penetrate into your skin without being unnecessarily harsh to relieve your symptoms. Jock Itch: If you're struggling with jock itch, it's essential you treat it right away to keep it from spreading to other areas of your body and keep it from becoming worse. An anti-fungal product like Clotrimazole will treat jock itch effectively and relieve your uncomfortable symptoms. When you apply Clotrimazole to the infected skin area, it destroys the yeast or fungus that is causing the infection. Your doctor will let you know the dose of Clotrimazole to use and for how long. If you've been provided with a prescription, the dose will also be added to the medicine label. Always use your medication as the leaflet (included with your prescription) describes or as your doctor indicates. If you're not sure, talk to your doctor. If you bought this medicine without a prescription, be sure you read and follow the directions closely. Pierce the tube seal before using by putting the cap upside down over the end of the tube and pressing. Thoroughly wash your hands before applying the cream. This will keep the infection from spreading. Apply Clotrimazole evenly and thinly to the affected area, two or three times a day and rub it in gently. Squeeze the length of cream out onto your finger. Be sure to apply the cream to all skin areas with fungal infection. Don't rub the cream hard or you could irritate your skin. Don't apply the cream to any skin that's not affected. Always wash your hands after you use Clotrimazole to help prevent the spread of the infection to other body areas. Also, you'll want to use a separate towel than other individuals until your infection clears. Like all medications, this medication could cause side effects, however, not all people experience them. These symptoms could indicate you're allergic to the cream. If you experience any side effects, let the doctor know. This includes any potential side effects that aren't listed on the enclosed leaflet or listed here. Don't put Clotrimazole in your mouth or swallow the medicine. If you swallow the medicine accidentally, contact your nearest hospital's Accident and Emergency Department or your doctor straight away. If you get the cream in your mouth or eyes accidentally, immediately wash them with water and then call your doctor. Do not use Clotrimazole if you're pregnant or breastfeeding if the doctor hasn't given you the okay. Don't use this product if you're allergic to any of its ingredients. Let your doctor know if you're currently or have recently taken any other medications. This includes medications you obtain without a prescription and health supplements. Clotrimazole isn't known to interact with other medications. If you experience any side effects, including those not listed as potential side effects on the leaflet, after taking Clotrimazole, let your doctor know. You can also visit the Yellow Card Scheme website to report your side effects directly. By reporting your side effects, it helps provide more information on potential Clotrimazole side effects. What should I do if I forget to take Clotrimazole when I should? Apply the cream as soon as you remember and continue on with your treatment regimen. What should I do if I take too much Clotrimazole? You're not likely to experience any harm if you've taken an extra dose of this medication by mistake. Can I drink alcohol while taking Clotrimazole? Physicians advise you to not drink alcohol when you're using Clotrimazole or any other antifungal medication. Because alcohol is metabolized in the liver, taking Clotrimazole while consuming alcohol could add heightened stress on your liver. This could lead to you experiencing symptoms similar to a hangover. In addition, it could lead to severe liver problems. Will Clotrimazole impact my ability to drive or operate machinery? Clotrimazole won't affect your ability to operate machinery or drive. When Pregnant: Tell your doctor if you are pregnant before using Clotrimazole.